Sign up to my newsletter and you can enter the free draw to win this original painting worth £150 of A caravan tea shop in St Ives, Cornwall. This watercolour study of a caravan at St Ives is 28cm x 10cm, signed and mounted on acid-free card. The newsletter will be sent out on the 25th January 2018. I look forward to your sign up in the box on this page. 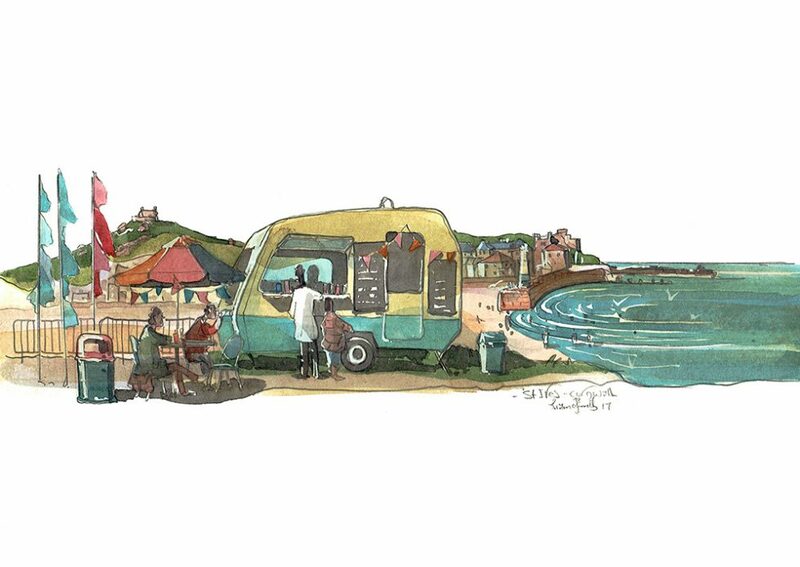 I did this small painting of an old 70s caravan converted to a tea, and sandwich shop on Porthminster Beach in St Ives, Cornwall. It was covered in bunting, and other flags to give a bit of cheer to what was rather a gusty day. I had Tea £1, and a cheese sandwich £1.50. Whats not to like? Love it, love it, I am already signed up! It would look great on my wall with your other pictures!